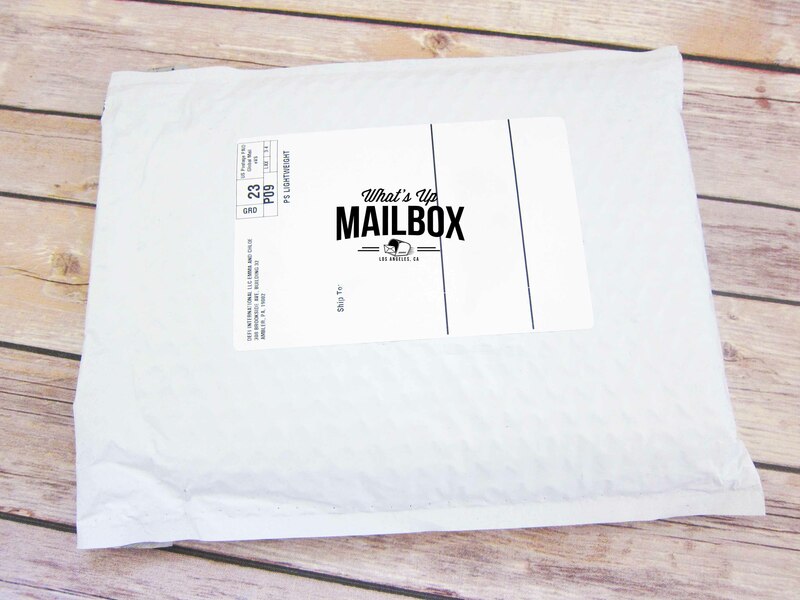 Coupon: Use code WHATSUPBOX50 to get 50% off your first box! That brings the cost down to $17.50! 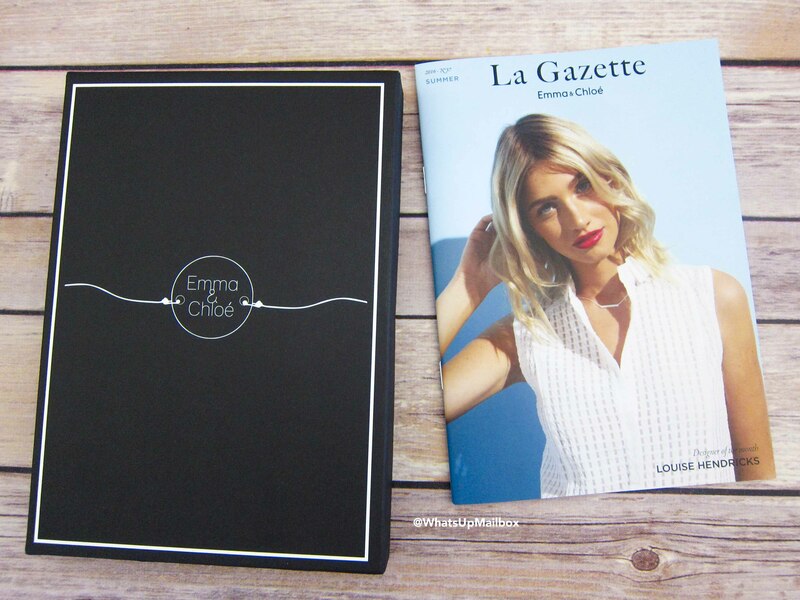 Emma & Chloe is a French jewelry subscription box that ships 1 jewelry item every month that’s made in France. They initially only shipped to Europe but started shipping to U.S. this year (so happy when that happened!). And since I love everything French, I subscribed in a heartbeat! When you first subscribe, you’ll be prompted to answer a couple of questions regarding your jewelry preferences. And as a bonus for being a subscriber, you’ll also receive 20% discount on anything in their online shop! Their boxes ships through DHL and it typically takes about a week to arrive to me (Los Angeles). They’re packaged in white bubble wrap padded envelopes, unmarked so it’s safe from prying eyes. I say this all the time, but I just love how they’re boxes are! They’re different than any other boxes I receive from other subs and they feel so luxe and look so chic. It’s also made of thick and sturdy cardboard material so you can totally reuse them! The box opens up like a book which is quite unique in the subscription world. I personally like that a lot. It makes it easier to open and close versus boxes that have a lid on them. 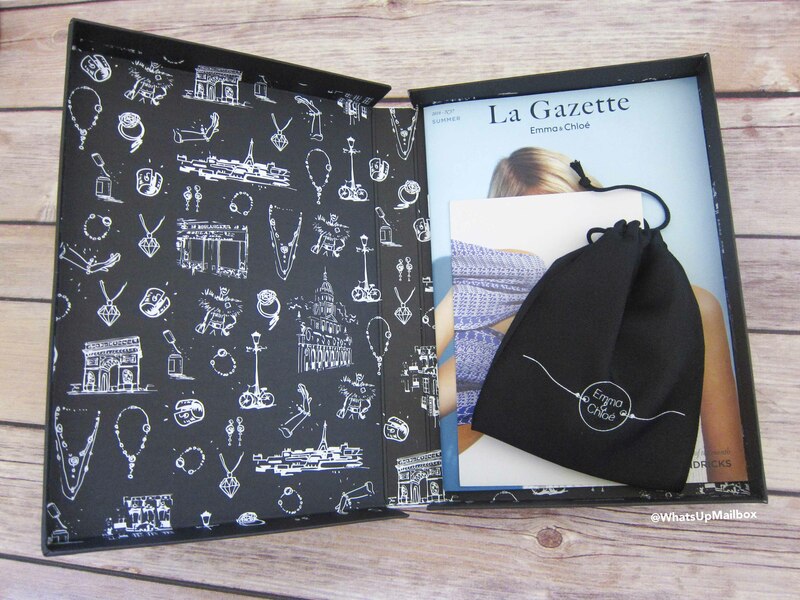 First look at unboxing shows their jewelry pouch as well as their info magazine, “La Gazette”. Their Info Magazine is quite thick and full of useful details as you’ll see in the pics below. The first page is their Table of Contents. So many useful contents! 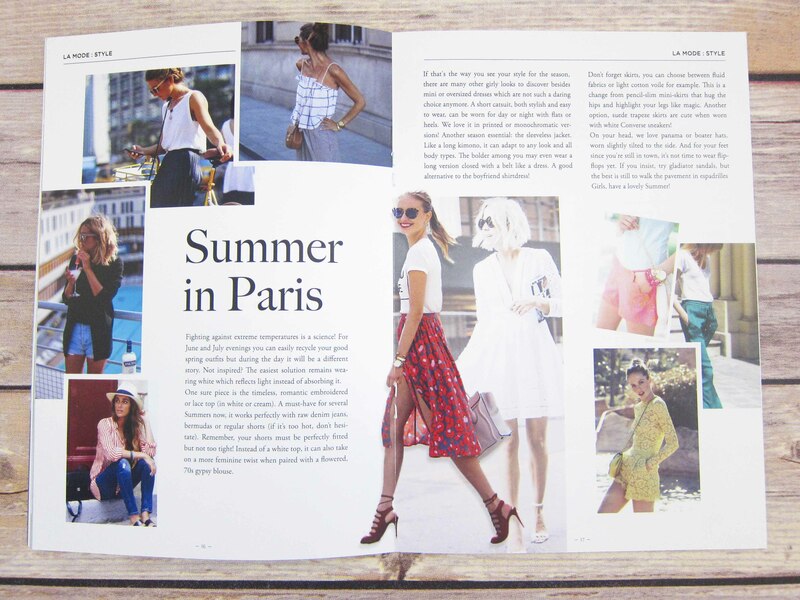 A section on Parisian summer fashion. 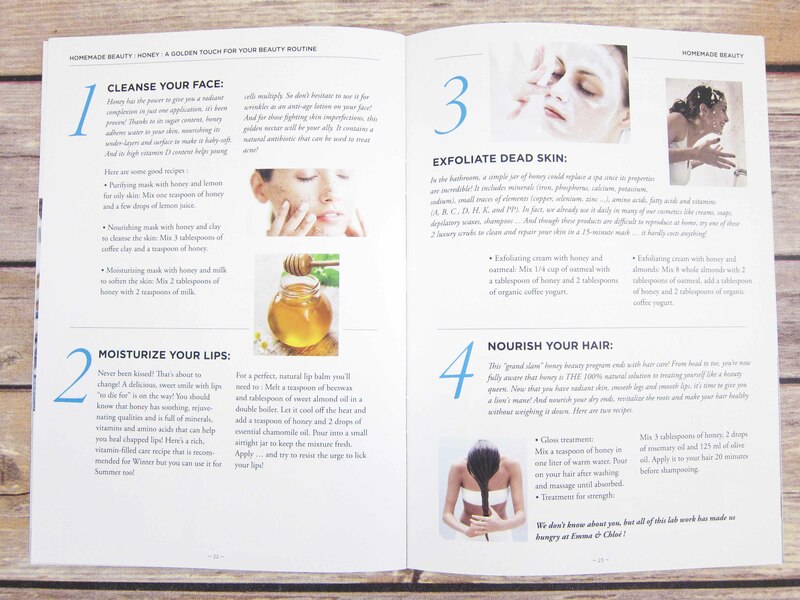 They also always seem to have a “Homemade Beauty” section and this month they focus on honey and how to incorporate that ingredient to make your own homemade beauty product. How useful and amazing is this! 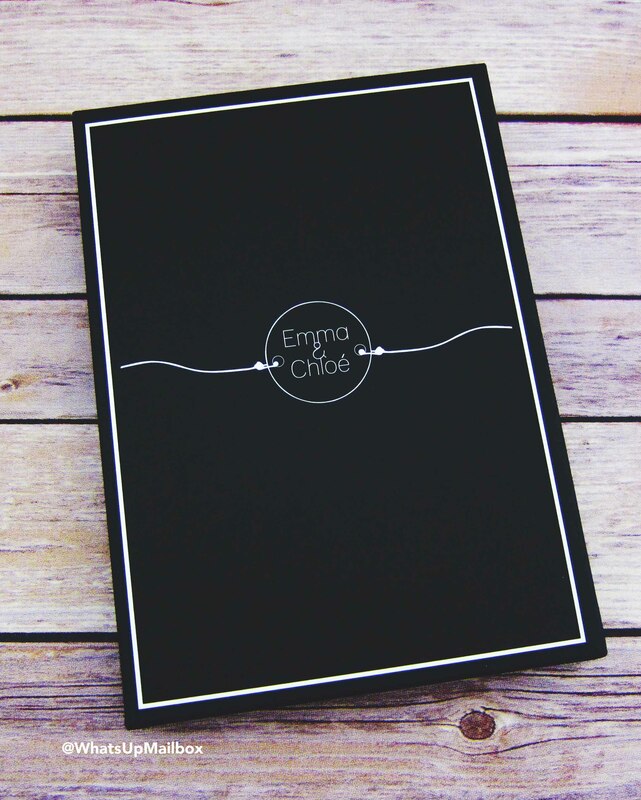 Emma & Chloe sends their monthly jewelry pieces in these black drawstring pouches. Because what good are your jewelry if it’s not kept properly right? I’m not sure if they’re anti tarnish, but they are super handy for when you need to travel and separate your jewels from scratching each other. Another blue jewelry item! My item in May also incorporated blue gems and since I’m having a major crush on this color this summer, I am super happy to receive this! Subscribers will receive this necklace in either gold or silver (depending on your preference) and although gold is my preferred metal of choice, sometimes silver just looks better on certain outfits. FYI, you can have them surprise you with either gold or silver instead of the same metal for every shipment. It’s one of the options you can select in your style preference. 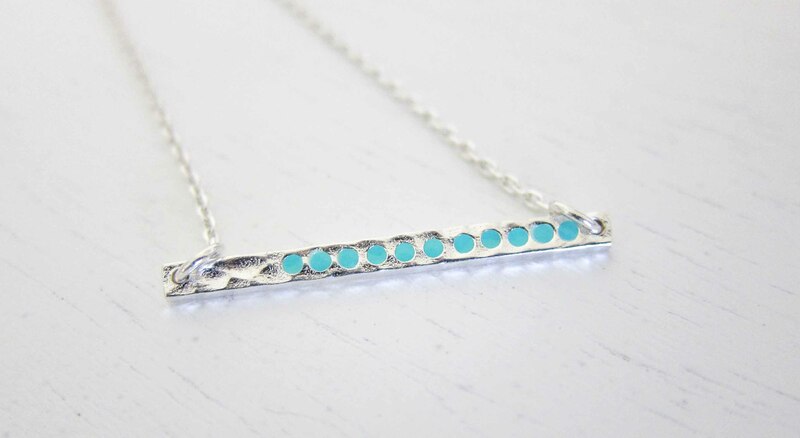 This necklace is brass gilded with fine silver and a bar pendant that has a row of turquoise stones. I find the style to be simple yet chic, plus you can wear this alone for a minimalistic look or layered for extra glam. They also include a “Certificate of Authenticity” with every jewelry item, so you know it’s 100% authentic, gorgeous and precious too! I tend to wear silver with a more casual jeans look. I like the simplicity of this necklace and how the turquoise blue shines at certain angles. This is definitely one of those styles that are delicate and a good basic design to have in your jewelry collection. 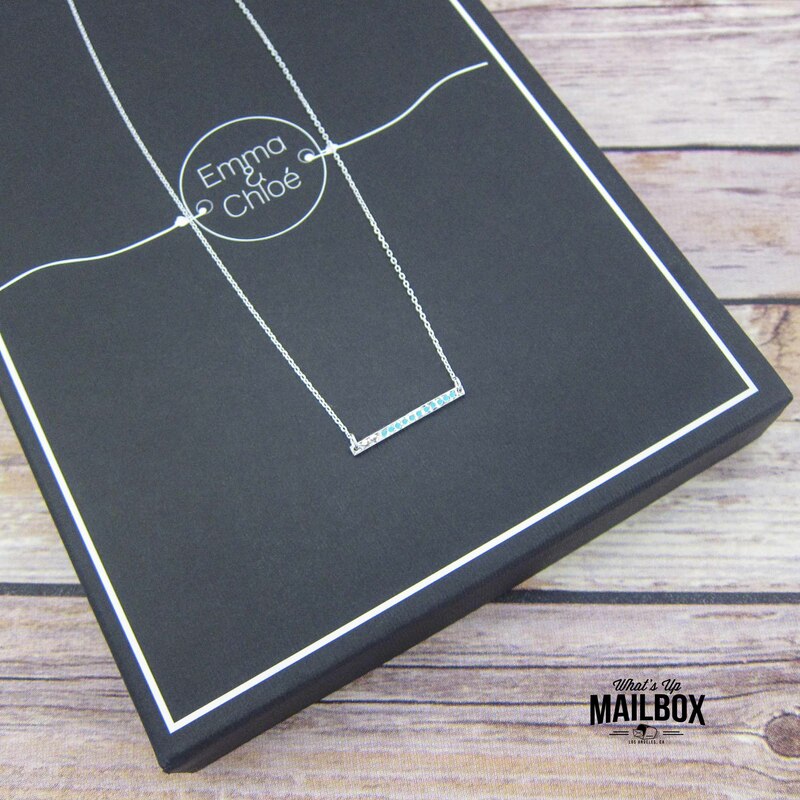 With every box, Emma & Chloe also includes a postcard with the front picture being a model wearing the jewelry item of the month. My Thoughts: It’s such a treat to open up my Emma & Chloe boxes, I’m always looking forward to see what they send everytime! And knowing that the jewels are from French designers, I know that it’s unique and truly special. And the quality, such high quality that you rarely see in costume jewelry especially with the $35 price! The necklace that this month brings is simple in design but chic in everyway. I can’t rave enough about this subscription and it is one that I treasure and will keep subscribing for as long as they deliver! Interested in subscribing? 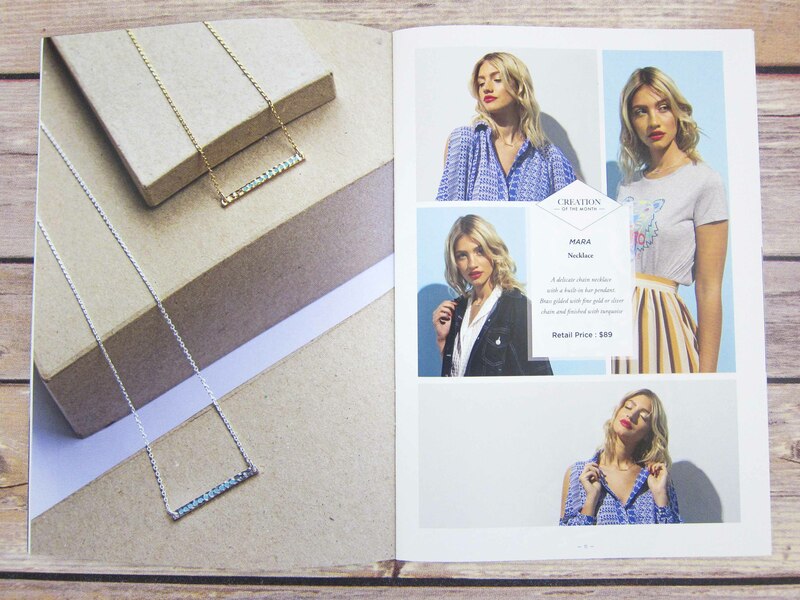 Visit their website to subscribe and start receiving French jewelry in your mailbox! And don’t forget to use coupon code WHATSUPBOX50 to get 50% off your first box! That brings the cost down to only $17.50 for a gorgeous French Jewelry item!